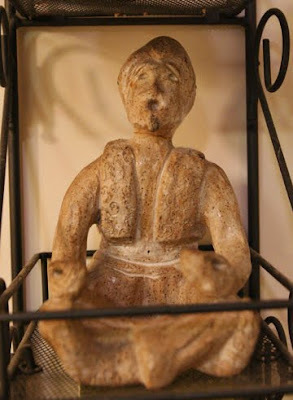 This little statue is a clay piece I did way back in high school, like 11th or 12th grade. This thing has survived my pyromaniac brother, you can see the scorched beard and hands. It's head has broken off, cleanly, so I was able to glue it back on. And it has traveled back and forth from Florida and Norfolk. So, if nothing else it is resiliant. I was going for something that represented my Persian roots hence the Ali Baba dude. I don't know why I put him in the position he's in, it just seemed right. I don't know why I put his hands into a mudra or why it looks like he is chanting. None of that is really Persian but it is very yoga. Old Ali Baba is sitting in easy pose, sukhasana, holding gyan mudra and chanting, we'll say Om. It's almost like I created this statue from a vision of my future. I didn't know anything about yoga when I was 16/17 but this little statue is all about the yoga.